Solomon Exam Prep is excited to announce its appearance at LAMP March 10-13, 2013 at the Manchester Grand Hyatt in sunny San Diego, CA. LAMP is GAMA International’s annual Leadership and Management Program meeting. Come by our booth to learn more about Solomon’s corporate study solutions for the Series 6, Series 63 and Life & Health licensing exams. We will be showcasing our new website & giving away some great licensing exam swag! Which of the following is not true of an ECN? a. ECNs always act in an agency capacity and do not trade for their own account. b. ECNs allow institutional investors to trade with other investors excluding the broker as a go-between. Fourth market participants rely on ECNs. c. Subscribers to an ECN may include institutional investors, broker-dealers and market makers. Individuals that wish to trade through an ECN must have an account with a broker-dealer and their order can then be routed to the ECN for execution. d. ECNs allow traders to remain anonymous. e. ECNs are often open 24 hours a day, and are therefore often used by traders after regular market hours. f. Subscribers pay a fee to the ECN to participate. ABCD is an actively traded security with an inside market of 19.25 – 19.95. A market maker receives an order to sell 100 shares and buys the security from the customer at a net price of ______________. Choose the net price that makes the most sense given what you know about markups, markdowns, and net prices. Rationale: On a sell order in an active competitive market, the net price will contain a markdown from the best bid. In this case the only price that is lower than the best bid is the $18.75. The markdown amount is calculated by taking $19.25 – $18.75 = $.50. The markdown is $.50/$19.25 = 2.60%. This week’s study question from the Solomon Online Exam Simulator question database is now available. Be sure to submit your answers in the comments section and check back tomorrow for the correct answer and rationale! Question (Relevant to Series 65, Series 66, Series 7, and Series 79): Given the following assumptions for stock ABC, what is its expected return using the Capital Asset Pricing Model (CAPM)? Risk Free Rate: 1%; Expected Return on general stock market: 7%; Beta: 1.;, Sharpe Ratio: 2. Before allowing a customer to buy shares in an IPO, the member firm must receive a representation that the account is not restricted by the account owner. How can this form be obtained initially? Sam bought 1,000 shares of XYZ Corporation three months ago and the stock has appreciated significantly over that time. Sam decides to go short against the box. What does this mean? A: Sam has decided to short 1,000 shares of XYZ. B: Sam has decided to write 10 call options of XYZ stock. C: Sam has decided to write 10 put options of XYZ stock. D: Sam has decided to sell his shares of XYZ and then buy the shares back after a 30-day window. When an investor goes short “against the box” it simply means that the investor has shorted shares that they already own with no intention of delivering their own shares by the settlement date. This practice is called “against the box” because the owned shares are held safely in a box, while borrowed shares are sold. Shorting against the box used to be a common tax deferral strategy. By selling borrowed shares, the investor could defer a capital gain to a more favorable later time. Current tax law no longer permits shorting against the box to be used as a tax deferral strategy – when an investor shorts shares they already own it is treated as if they have sold the shares and the gain is recognized immediately. *Questions featured in the weekly study question series are sampled from Solomon’s industry-leading Online Exam Simulator. Today, we’ll be starting a weekly series highlighting a licensing exam study question from the Solomon Online Exam Simulator question database. To calculate a markdown as a percentage, which of the following are used? Be sure to submit your answers in the comments section and check back tomorrow for the correct answer and rationale! Solomon Exam Prep’s line of study materials for the Series 62 exam is growing. 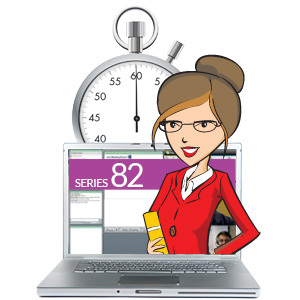 We are excited to announce our new live, interactive online classes for the FINRA Series 62 Corporate Securities Limited Representative Qualification Exam! Studying for the Series 62 can be a daunting task: the 50-page FINRA outline is long enough to intimidate even the best of test takers! Let Professor Karen Solomon, Ph.D. guide you through the intricacies of corporate securities including corporate bonds, rights, warrants, money-market funds and REITS. Professor Solomon will give you the best need-to-know information in four 2-hour sessions. This live, online class will feature practice questions mixed throughout the easy-to-understand lectures. And your questions are not just allowed, but encouraged! If you miss some or all of the sessions, not to worry: with your purchase, you will also enjoy 15 days access to your recorded class! Our next class starts Monday, January 30, 2012. Visit our website or give us a call at (503) 601-0212 to sign-up today!